They cover a lot of ground. Which makes them a good fit for working with large energies in your life. This reading gets you into the flow and navigate what’s tossed at you. The Personalized Large reading creates a base for you to leap from and dive into your life. They create a great foundation for you to create new ways of being and transform yourself. More importantly help you sustain that metamorphosis. This reading focuses on what you need right now and caters to what’s currently going on in your life. It zeros in the now since it is completely customized for you and the situation. As always you get the infamous thought Prompts and email support. You might notice that I am into transformative experiences and finding ways to create ease and space in them. Because feeling like you are going through the meat grinder during intense change is not fun. Done it! If you are new the above is part of why people keep coming back for more. These are very extremely extra intuitive I might use a template or I might not. More often then not, you give me the details and I pull cards and break them down into digestible chunks. The Spirit Guide Reading that gets you in touch with your personal Guides and brings you the messages they have for you. This is a fave of mine and I used it when I was getting back in touch with my peeps. So much easier then trying to figure out all those obscure signs and songs! The StarDust reading that is based in creating a practice of self love and care. It works on the precept that we are all divine in nature and a natural extension of the Universe. Need a boost of love this is a good reading to pick. Akashic Records You can always ask for one these readings when you buy this option. Otherwise we work out what you want your topic to be and I sling some cards and break’em down for you. All readings are based in love and compassion. How can the difficult be made more inviting yet still truth filled? The goal is to empower you not make you feel like you got mugged by the transformation in your life. It is all about finding a way for you to feel safe enough to explore your potentials. What makes this a large reading? In Bethland a large reading is any reading using 9 to 14 cards. Plus you get an Affirmation card tacked onto the end of the reading for you to use as your mantra. Email support to help you with questions or if you need a tool for your spiritual tool box. You are ready for a metamorphosis. Want to get a reading. You want more sacred in your mundane. Have a sticking point you can’t get worked out. Because it is fun, meaningful, and transformative. 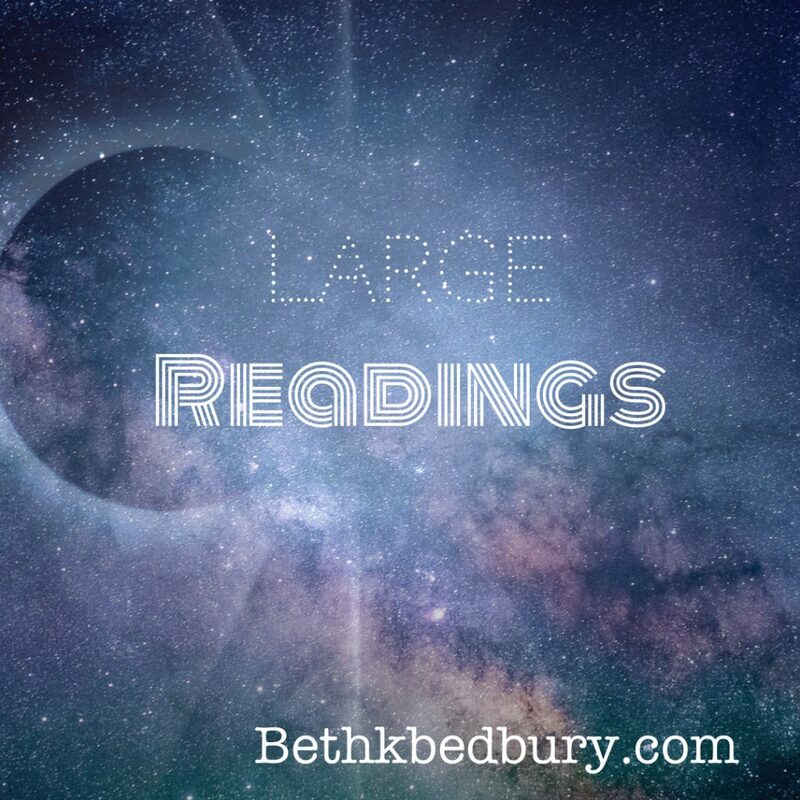 All readings are customized to your needs and you will receive a PDF of your reading in you inbox when it is done. I may use Tarot or Oracle cards. Disclaimer: This is not predicting the future it is a form of coaching that uses Tarot and Oracle cards. This is not a substitute for medical, legal, or any other professional advice. All Tarot/Oracle card readings sales are final.